Make an impact with these eye-catching Creole hoop earrings. Crafted from luxurious 9ct yellow gold for a classic look, these chic hoop earrings feature an elegant slim twisting design for a modern update on a traditional style. 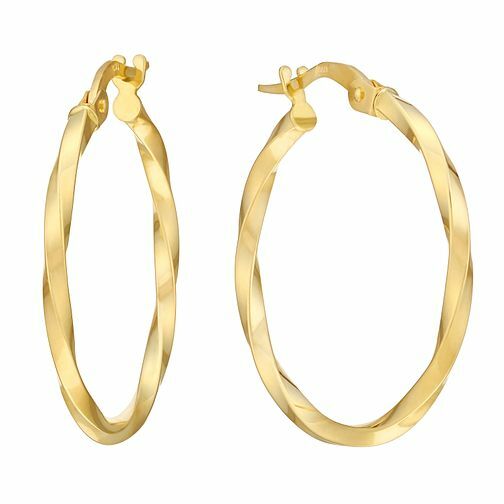 9ct Yellow Gold Twist Creole Hoop Earrings is rated 4.7 out of 5 by 9. Rated 5 out of 5 by Anonymous from Lovely item - exactly a advertised - great price I purchased this item for my wife for Christmas so was a little nervous as some jewellery is not as good in real life as they look on screen, but I needn't have worried. The earrings were a big hit with my wife and were exactly as advertised. They were also cheaper via HS than other sites which was a bonus. Rated 5 out of 5 by Anonymous from Beautiful earrings, great quality Beautiful, elegant design and very good quality. Light weight so they aren't heavy on my ears and I can wear them all day. I even washed my hair while wearing them once by accident and they were not damaged.